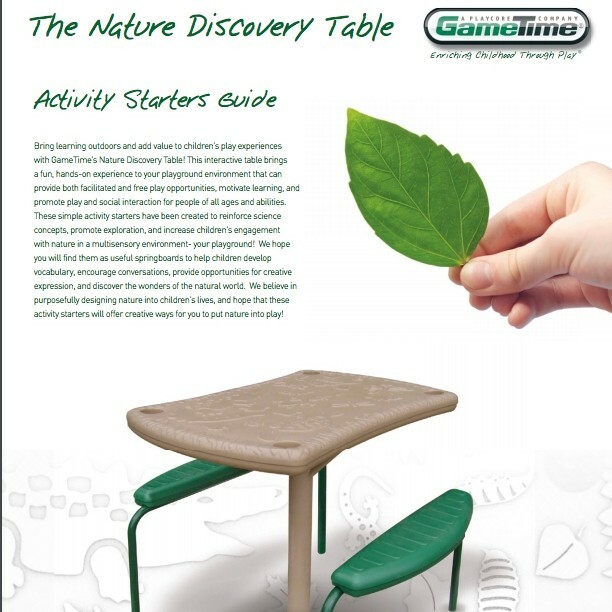 Bring learning outdoors and add value to children’s play experiences with GameTime’s Nature Discovery Table! This interactive table brings a fun, hands-on experience to your playground environment that can provide both facilitated and free play opportunities, motivate learning, and promote play and social interaction for people of all ages and abilities. These simple activity starters have been created to reinforce science concepts, promote exploration, and increase children’s engagement with nature in a multisensory environment- your playground! They can be used as useful springboards to help children develop vocabulary and language skills, provide opportunities for creative expression, and engage with natural loose parts. We believe in purposefully designing nature into children’s lives, and hope that these activity starters will offer creative ways for you to put nature into play.